If you talk 1-on-1 with clients like I do, you know it can be challenging to make appointments. Finding a good time for two busy people to meet, and doing the mental gymnastics of figuring out time zone differences, can be a real challenge when you’re trying to book appointments yourself. Luckily, there’s a super simple solution – scheduling apps that allow clients to grab a spot on your calendar at times of your choosing. Having a calendar to refer people to, whether it is for free consults or paid appointments, makes things so much easier for everyone involved. One added benefit is that it allows you to get a better handle on your day by creating standard appointment spots on your calendar. Let’s say you stay really busy with calls, but need to make sure there’s always time built into your week to actually work ON your business, and not just IN it. Having a set schedule helps a lot! An appointment calendar is a big step in telling your time “where to go” so that you can be more productive. Scheduling apps also save you time by taking out the back and forth (and back and forth) that is often involved when two busy people are trying to find a mutual open spot in a week. If someone wants to talk with you, just let them know that the easiest way is to hop on your calendar. They’re sure to appreciate how efficient it is to set something up. Most scheduling apps are web-based, compatible with iCal and Google Calendar, and do not require the client to download any software to schedule an appointment. There are lots of choices out there, so there’s bound to be something to meet the needs of your business. If you’ve ever booked an appointment with me, then you know that I use Appointy to schedule both free consults and paid sessions with my clients. It’s a lifesaver for me! It syncs to my Google calendar, which in turn syncs to my iPhone calendar so that no matter what calendar I am looking at, I know what I have scheduled. I also use Appointy like a CRM tool. It creates customer profiles for everyone that schedules an appointment and stores all of the info for you. You can see past and future appointments and add your own notes to their profile to reference later. I love having all of that info in one place! Customers can schedule in-office or phone meetings with you in a very easy manner. TimeTrade makes this, and so much more, simple for entrepreneurs. Acuity is a great way to automate your cancelations, reminders, client bookings, and yes, even your payments. It's a great system to remove any frustration you may be feeling due to trying to schedule and fit everyone in. Not only does it keep you in touch with clients, it offers so much more. You'll never have a client fall off the radar again. 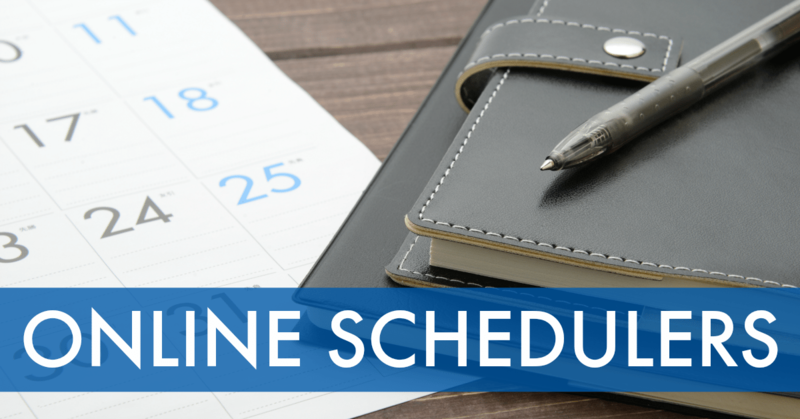 Send and receive appointments for both you and your team with ScheduleOnce. Automatic member assignment, bookings for rooms and resources are just a few of the talents this product has. This system is a one-stop tool for all of your needs. It now offers third-party integrations with GoTo Meeting, Webex, and several others. Vcita is an online scheduler, which makes making meetings easier while syncing with your phone, it's also a CRM. Gain insight into your clients, accept payments, and make sure your client relationships are strong and moving forward. With Square up, clients can log into your availability 24/7, pick a time that works for them, along with the service and staff member they would like to reach. If you don't have a webpage for your calendar, they provide one free of charge for you, to make bookings. The best part – know the moment a customer books with you with alerts! Interviews, meetings, calls – anything that you need to schedule can be done with ease with Calendly. Save time, sell more, and improve the way your clients connect with you. Share your calendar, let your invitees pick a time that works with them, and let it take it from there. Simple, sleek and a great affordable option. Booking right from your website has never been so easy. You decide what times are available, and the appointment type, making scheduling from online so much simpler. Accept payments online, manage your clients and get a daily overview every morning before starting your day. Which system do you use to book appointments with clients and prospects? What do you love about it? Tell us in the comments! Very helpful, Julie. Thank yu! I’m so glad it helped, Chara! I use youcanbook.me and am very happy with it! Thanks so much for sharing what you use, Gillian! I have been using FlexBooker for over a year now and have never looked back. I switched from your preferred system, but found FlexBooker’s support so wonderful. Thanks so much for adding to the list, Sarah. I hadn’t heard of that one before! I’ve been using Vcita for a few years and recently my online booking calendar started disconnecting, showing I had no availability when I actually did. Their response time is an average of 2 days, even when I mark messages URGENT. It’s been 10 days and my messages still have not reached the software team. I do not recommend Vcita. Your list is really helpful and I’ll be looking at changing vcita to something new that actually works.